What is the IEC of Rockland County? Established in 2006, the IEC of Rockland County is a nonprofit association of independent electrical contractors dedicated to furthering the growth of the electrical industry through skilled manpower and the principles of free enterprise. 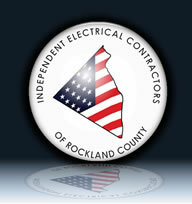 The IEC of Rockland County is a unified voice that helps to support and advance industry needs and issues. Its members are friends and professionals who provide construction, installation, service and repair work for residential, commercial, and industrial customers all throughout Rockland County and the tri-state area. By drawing from the dedication and desire of our contractors, our county will be able to benefit from the flexible array of services our members provide and competitive pricing which helps maintain an affordable cost of living. Each of us take a great deal of pride and integrity in the way we make a living and seek to better Rockland County electricians and consumers. We are one of over 70 chapters nationwide and are aiming to level the playing field between union and non-union electricians by fighting anti-competitive legislation like PLA's, which only raise the cost of living for us and our children in our community. Electrical and systems contractors and their associates are all eligible for membership. Each month, we meet to discuss the pressing issues of the industry in our county, cost-savings services and ideas, and innovative safety programs. Contractors of all sizes and experience will benefit from membership in the IEC. Our mission is to provide benefits for membership growth and legislative representation through education and communication. We are dedicated to better Rockland County by developing and fostering a stronger economy through the level of quality and services our members provide to the industry. We aim to provide our members with high standard education, to instill professional pride and integrity in our profession, and to be actively involved in the legislation in our county. "Professionalism through unity in training and services"
© 2019 Independent Electrical Contractors of Rockland County. All rights reserved.